It’s not the happiest day today, as if anyone needs reminding. The 10th anniversary of a terrible event which changed America forever. The weather seems to be paying tribute: I woke up to pouring rain and frosty cold creeping in through my open window, while just yesterday I was wishing I had a fan because it felt so hot and humid in my tiny attic apartment. I lay in bed for quite awhile (my guilty Sunday pleasure) not quite knowing what to think or how to feel about today. On the one hand I feel a hope which is bolstered by the demonstrations and social changes which have been sweeping across the Middle East these last few months, on the other hand I feel sad for the families of 9/11 victims, and particularly for the first responders who are fighting daily to win basic human rights from their government: health care. I have no resolution, no inspiring words. I only have the comforting breakfast which I made to warm up both my temperature and my mood this morning. 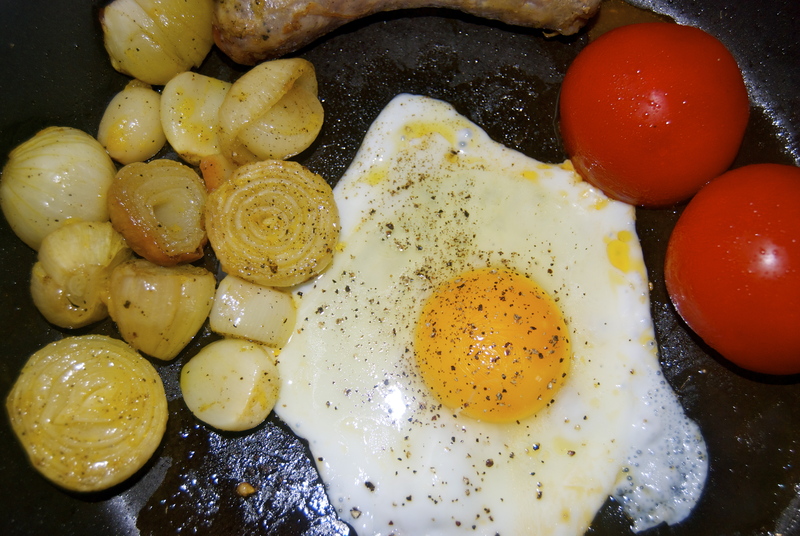 My scaled down fry-up. I love meals that can be made it one pan. The traditional English breakfast includes one or two sausages and rashers of back bacon, two fried eggs, fried tomatoes and mushrooms, served with toast and marmalade on the side. There are many variations and everyone has their own specific way of making/eating it, but you get the general picture. So, this is what I woke up craving. Unfortunately, everything is closed on Sunday in France so I had to work with I got at the market yesterday and les restes (the leftovers) in my fridge. I didn’t even have bread to sop it all up with! But I made do. 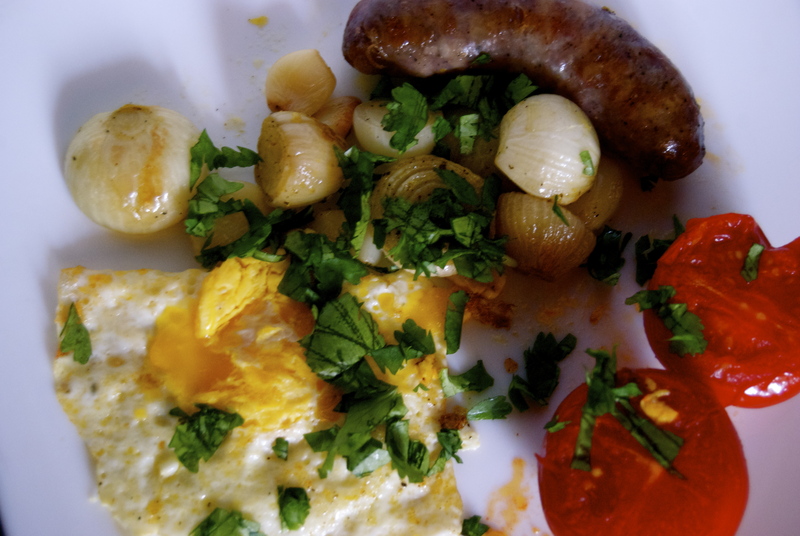 My ingredients included 2 fresh tomatoes, 1 big sausage (local and organic if you can swing it, makes such a big difference), 1 fresh egg, leftover roasted onions and garlic and a handful of chopped flat-leaf parsley. 1. Cobble together whatever ingredients you have available. Eggs and some sort of meat are a must, but the rest is up to you. Leftover grilled or roasted veggies would be great, especially spinach and potatoes if you have them on hand, and some fresh herbs to perk things up. 2. In a large pan, add 1 tablespoon butter or olive oil and cook your sausage and bacon over medium-high heat. Cooking time depends on size of the meat, use you judgement (or an instant read thermometer if you’re nervous, 160 degrees is the general safe temperature for pork sausages). Usually bacon requires less time than sausage, though this depends on how crispy you like your bacon! If using whole tomatoes as I did, I would add them to the pan at the beginning along with the meat. If using toast, toast the bread in the meantime. Or, do as my boyfriend does and quickly fry it with the leftover fat from the meat once is has been removed from the pan. 3. Once meat has only a few minutes left, add leftover veggies to pan to reheat. 4. 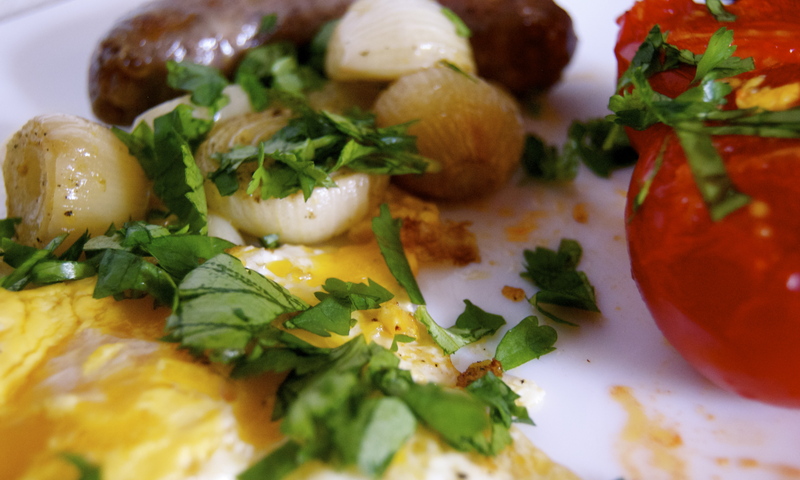 When meat is practically done cooking, add egg(s) and cook to desired consistency. 5. Add some herbs (this is definitely branching off from the traditional English fry-up as they generally never include something green!). Gobble it all up enthusiastically. The bell tower of the nearby cathedral. Lucky me, I got to sit down and enjoy my breakfast to a serenade of church bells. 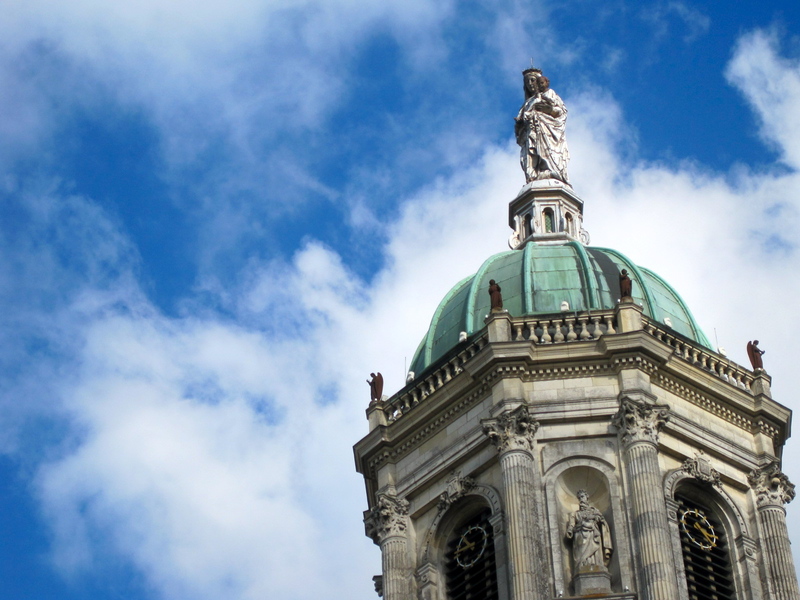 I love how often you hear church bells in Europe. It’s hard to go a day without hearing them tolling off in the distance somewhere or another, and I’m not complaining. So, my belly is full, the sun is peaking out and I think it’s time for me to go for a stroll in the nearby park to help me digest this breakfast a bit. Keep you spirits up, cook a good meal, and better yet share it with someone you love. Thanks for the kinds words Dave. Yes, I’ve heard of Bubble and Squeak, and I even thought of adding it in there but I had read that it’s traditionally made into a sort of patty binded together with potatoes? Is it much more general than that? Boudin noir is big in Brittany too, and I love it. I’ve had it in quiche and on it’s own, but never thought to add it to breakfast. Thanks for the suggestion! I WANT THIS FOR BREAKFAST PLEASE! Your last sentence is not only a good idea for today, but not a bad approach to life as well!